Products Solenoid Valve Series | TDS Co., Ltd.
Products　Solenoid Valve Series | TDS Co., LTD. Direct operated DC solenoid with valve buried or connected into the plunger. 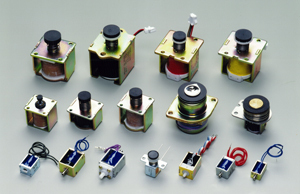 TDS Solenoid Valves are valves operated by solenoid plungers. As well as off-the-shelf solenoid valves, TDS offers small and light weighted customized Solenoid Valves to meet special requirements. (1) TDS-V series Solenoid Valves are open frame or tubular DC solenoid with valves of elastic or other materials buried or attached into the plungers at the edge or the other side of the plungers and the valve bases are embedded within the solenoid bodies. Normally Open (NO) and Normally Closed (NC) solenoid valves are available to suit customer's needs. (2) The best suitable material and structure for the fluid to be used are selected for the valve and solenoid parts when designed to meet various requirements from our valued customers. *　The external dimensions are based on Open Frame Solenoids. Note: Fluid assumption used in this chart is air. Please consult TDS for the usage of other fluid.